Easter is this weekend! I think I'm a little in denial. We haven't colored Easter eggs and I haven't even thought about decorating my house festive! But I have been on the hunt for some cute spring dresses, and this floral dress from Zappos would be so perfect for Easter. The floral pattern on it is a little more sophisticated than some of the other floral dresses I've seen. And you wouldn't guess it from the photos, but the material is stretchy, which makes it super comfortable! The sleeves, the length, and the fact that it has pockets all add to my love affair with it. I was going to wear it to church last Sunday, but I've been fighting a weird cold that left me with no voice for almost 4 days. So this might end up being my Easter dress after all! 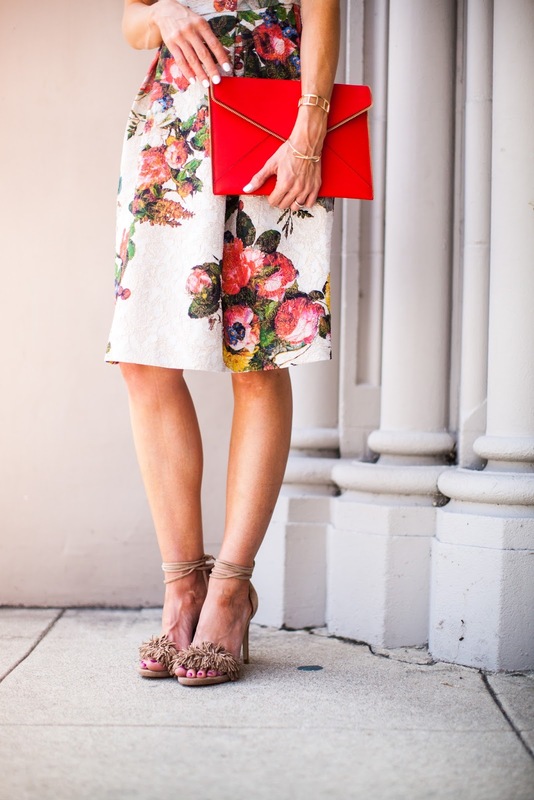 I've been searching for a good floral dress for a while. I usually jump on my Zappos phone app so I can do some quick browsing at the park while the boys are playing. Ordering from the app also gets you free next business day shipping. Like...why would I even hassle with going into a store to shop!? I paired it with this bold poppy clutch (it's less than $100 and comes in 9 colors) and these cute fringe sandals. To be honest, I don't mind if a heel isn't super comfy if I think it's pretty. I'll still wear it to church or on a date when I know I won't be walking much. But these heels are surprisingly comfy. The reviews on them said to order a half size larger than normal. I'm usually a size 8 so I ordered an 8.5 and they fit great. I didn't stress too much about the sizing because shipping and returns with Zappos are always free and fast.